Sweet summertime has finally arrived and pools are opening up, big time! However, don’t be so quick to close up that hot tub for a couple months. One big misconception that many have about their spa is that they can’t use it as much during the summer. By keeping your water and tub clean, and the temperature just right, your spa can actually be enjoyed in many ways all twelve months of the year! It’s Squeaky Clean: To get your spa ready for summer you should begin by cleaning the filter of your tub. This filter cleaner can be used to remove any of the scum, oils, or gunk from the cartridge of the filter. Be sure to continue cleaning your cartridge throughout the summer and rest of the year, by soaking your cartridge in the cleaner and water solution for about 24 hours. After that, rinse your cartridge and it will be ready to use. Test Away! : After cleaning your cartridge, be sure to use these testing strips to measure Chlorine, Bromine, Alkalinity, Total Hardness and pH levels. Measuring these levels will assure you that the chemicals in your water are safe for you to be exposed to and you can use your spa. If levels are uneven, be sure to contact a consultant at Spas and Stuff to help you add the proper amount of chemicals required. Keepin’ it Cool: Warm summer temperatures call for a nice cool down, so turning your spa’s temperature down to 85 degrees or even turning the heater off, allows you to have a nice, relaxing time. For the cooler summer nights, your spa’s regular temperature may be just right. To make sure the temperature is just the way you’d like it, you can help monitor it in your spa with this floating thermometer. If you have a pool, feel free to use this for your pool as well. The floating feature prevents this tool from being pushed around or to the bottom by the jets of your spa. Fit & Fun: Summer is a time where many like to get in shape and stay active. You may not consider your hot tub a place where you can exercise – but think again! With tight muscles, that warmer water will help to loosen you up and prep you for some minor exercises you can do in your spa. The jets of the spa will help your body to recover from workouts, by massaging the muscles and relieving you from tightness in your back and neck. In any temperature, you can stretch or do small leg exercises like calf raises to help strengthen those muscles. Small squats in your spa will also help to increase your temperature and weight loss. With these helpful tips your spa will be ready to use for those laid-back summer days with family, staying active or fun nights with friends. Please contact your local Spas and Stuff with any questions. Tips for Buying Spas: Which One is Right for Your Home? If you've considered purchasing that spa for sale, you've undoubtedly dealt with a number of questions crossing your mind. Among the most common are "where am I going to put this?" and "which spa for sale is right for me?" Selecting a new hot tub for your home can be challenging, especially if you've never had one before. Fortunately, the process doesn't have to be a pain in the back. With a few helpful tips, you'll be able to effectively compare the spas for sale and select the one that best suits your needs and your space. Purchasing a spa for sale can be very exciting, but it’s also a great investment, which means it is important that you find one that best fits your budget and long-term needs. The best place to start is comparing available hot tub models within your budget. There are premium spas, Columbia spas, hot tubs with loungers, hot tubs without loungers, and all of these options offer different price points, sizes and options. It's a good idea to consider alternative models as well, such as inflatable spas that are more affordable, easier to maintain and are portable. All of these options can be found on our site, take your time browsing through to find the one that’s right for you. This is one decision that no one else can make for you. As you compare various spas for sale, think about how many people will use it on a regular basis. If you are retirees with grandchildren that only occasionally visit, a spa with space for two is probably the best option. However, a family of five will encounter constant battles of spa time if a smaller hot tub is purchased. Spas, generally speaking, can be broken down into two types: above-ground, portable or in-ground models. When you purchase an above-ground model, most are self-contained units that have all the pumps and hookups needed to be up and running in no time. In-ground models require installation work and a significant initial investment, but offer customization of parts to fit your specific needs. 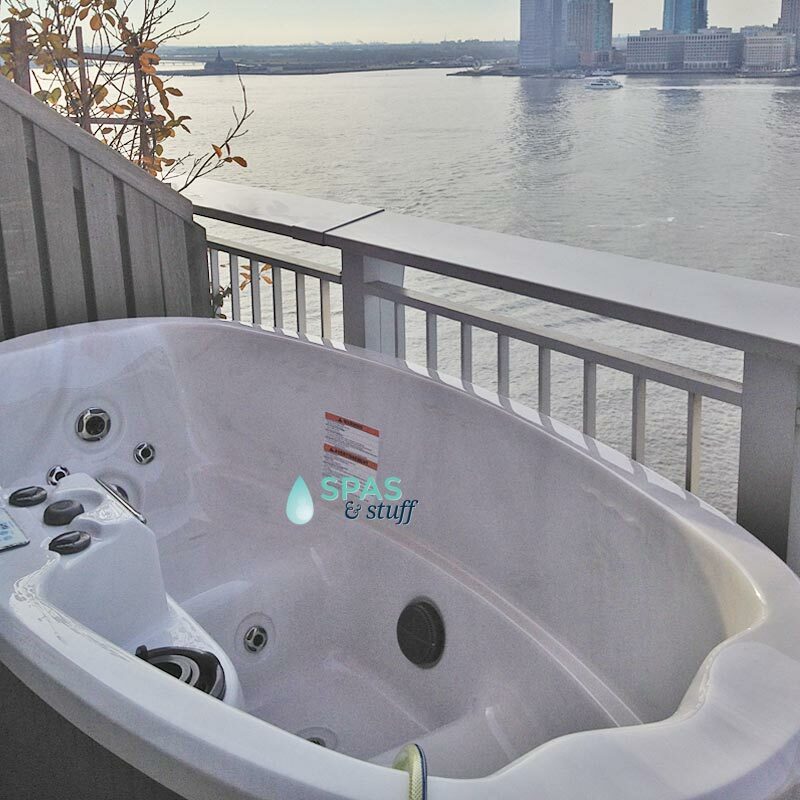 There are many different features and seating arrangements to choose from when looking at spas for sale. Finding one that best fits you and your family’s needs is important for you to be happy with your purchase for a long time. From two-seaters, to four-seaters, loungers to non-loungers all the options can be a bit overwhelming, but by taking the time to think about what you’ll most often be using the hot tub or spa for will help you make this decision. Natural gas prices might be falling, but that doesn't mean home utility bills will follow suit. Choosing an efficient model will help save energy and money in the long run. For example, the right pump for your tub size will not only save electricity by circulating water more effectively, it is less likely to wear out and break down as a result of being overworked. In this instance, you not only save money on electric bills, but also on maintenance. Following these tips for buying spas will help you make the right decision the first time. After all, there is no point in purchasing a spa that will add to your stress levels and further drain your wallet over time. If you are interested in purchasing a spa for sale, or have any questions about which model is right for you, give us a call, we’re happy to help! Spasandstuff.com now has a Shop Now feature on our Facebook page! 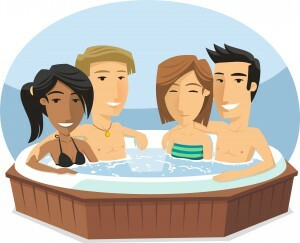 Click on it to view great hot tubs and hot tub products. You can Like products, create a Wishlist, and Share your favorites on your timeline, a friend's timeline, on a page you manage, or in a private message. Use this new Facebook feature to coordinate purchases with friends and family, or to show everyone where they can go to get you the perfect gift. This time of year, soaking in a hot tub is more popular than ever. That means there is no shortage of hot tub news for us to gather up for your enjoyment. The Huffington Post wants to remind everyone that with increased use of hot tubs in the winter comes increased chance of picking up an illness. This is also true of waking up, breathing air, and eating food, but it's still good to be aware. 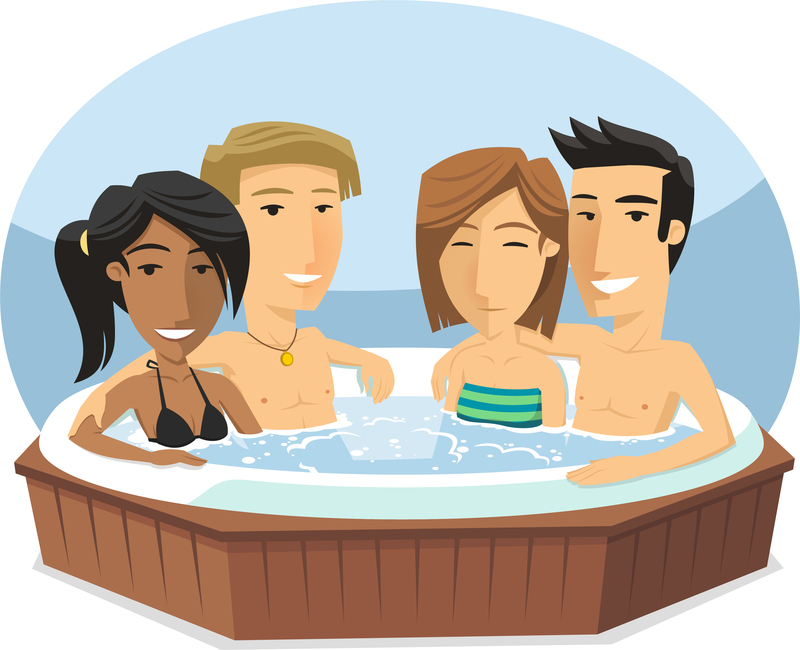 The high temperature of a hot tub can make it difficult to keep disinfectant levels as high as they need to be. The most common illness linked to improperly chlorinated hot tubs is the bacterium Pseudomonas aeruginosa, or "hot tub rash". It presents as an ear infection or a skin rash that takes the shape of the swimsuit the person was wearing, because the fabric held the contaminated water close to the skin. As always, keep a clean hot tub, rinse off before and after using the hot tub, and be sure to contact us at [email protected] if you have questions about cleaning products. A man was found dead in a hot tub at the Ramada Inn in Lexington, Kentucky. The cause of death was determined to be drowning. It has been deemed an accident, although authorities have not yet determined what caused the 52-year-old man to drown. It is always advisable to hot tub with a buddy, especially if you are at increased risk for heart attack, stroke, or fainting. 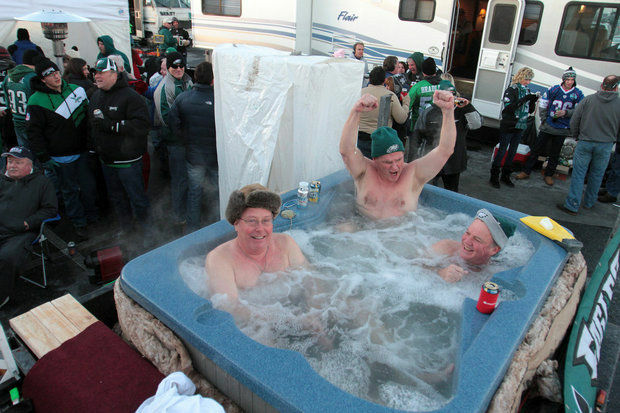 Somehow these Eagles fans set up a four-person hot tub outside the stadium where their beloved team faced off against the New Orleans Saints. How they filled it and powered it is unknown, but you've got to hand it to them for tailgating in style. Two men suspected of robbing two different homes were found hiding from police in a hot tub. It turns out this is not a great hiding spot when the temperatures are is sub-zero. After being arrested, one of the men was transported to a hospital where he was treated for hypothermia. A man was found hiding in a hot tub and wielding a machete after allegedly committing a series of bizarre crimes in Salem, Oregon. Apparently the man crashed a U-Haul, set a house on fire with gasoline, set a lawn mower on fire, robbed a different home of frozen elk meat, and then hid in the hot tub. Somewhere along the way he picked up the machete. After his arrest, he proceeded to kick the roof of the squad car, resulting in $1000 in damage. Police are unaware of the motive for these crimes at this time. 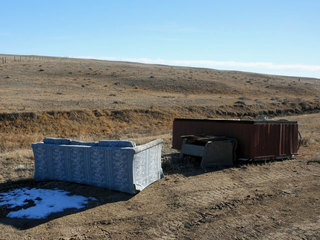 A hot tub was dumped on public Pawnee grasslands and then, a few weeks later, a couch was also dumped. Pawnee National Grasslands officials are looking for the culprit or culprits, as dumping on the lands is a crime. "Each time crimes like this occur, tax dollars must be spent correcting the situation instead of those dollars being spent on the management of Grassland resources," the officials said. If you have any questions about how to properly dispose of your hot tub, please feel free to contact us at [email protected] and we can direct you to the proper resources. Do you have any hot tub news happening in your area? Send us your stories and we'll include them in our next roundup! This entry was posted in Uncategorized, Hot Tubs and tagged hot tub news, hot tub illnesses, hot tub rash, pseudomonas aeruginosa, hot tub death, hot tub tailgating, hiding in hot tubs, hot tub disposal on January 9, 2014 by admin. The most enjoyable part of any hobby or activity is probably the stuff that goes with it. Horseback riding lessons? The helmet, boots, grooming tools and, heck, the horses are fun. Roller Derby? The clothes! The socks! The make up! The skates! Knitting? Soft skeins of wool, picking through beautiful sweater patterns, amassing a collection of wood, metal, and plastic needles--it's all pleasure. Owning a hot tub is no different. Anyone who purchases a hot tub and stops there is missing out on the fun of all the stuff that can go along with it. Here are just a few of the things that can complement owning a hot tub. For safety, maintenance, and hygiene reasons, purchasing a hot tub cover can be considered something of a necessity. Covers keep out unwanted bugs, debris, and people--just like pools, having neighborhood kids “hot tub hop” can be a legality issue. The Fun Part: Covers come in a variety of materials, textures, and qualities. And with colors available from "teak" to "nugget" to "port", you can find one that suits your spa and decorating aesthetic. Check out our sweet selection here. Tip: Consider purchasing a lock for your cover, to ensure the safety of children and pets and to really keep those darn neighbors from trying to sneak soak time at your expense. Bonus: A cover lifter can also facilitate hot tub security and use. Hot tub cover lifters can be attractive, efficient, and come with extras such as towel hooks. Plus, they're kind of fun to use. We have some really neat ones here. Saunas can be purchased to accommodate one or more people to enjoy at once. Like hot tubs, saunas offer their owners many health benefits. Infrared saunas have especially gained popularity with consumers and health advocates in recent years. Using one in conjunction with a hot tub is the ultimate in self-pampering, and can turn your home into a real relaxation sanctuary. Did you know we have an entire website devoted to saunas? We'd love to help you choose one that complements your spa! Bonus: Saunas come with their own neat accessories, like chromotherapy lights, aromatherapy aids, stereo and video options, as well as a variety of decorative options in design and wood choices. Patio furniture such as gazebo bars, patio benches, and tables with chairs can enhance the aesthetics and entertainment value of your yard or deck. There's so much to choose from! How about this really attractive 2-tier half-circle step available in 6 color options? Or this super cute towel tree in 9 colors? Water-resistant storage benches in 6 colors, anyone? Or this really beautiful, tilt-able Canton umbrella? There's really no end to the cute furniture pieces you can use to turn your hot tub into a resort. Whether your style is cute and sporty, or more elegant and refined, check out our full range of patio furniture options here. Bonus: Most of our patio furniture would also complement a sauna or pool. Aromatherapy is championed by many as facilitating well being and promoting a calming experience. You can make that happen right at home in your own hot tub with scents like Aruba Orange and Bahama Berry. These options are really just the tip of the iceberg. Other things to consider are special towels just for hot tub use, warm robes to wrap up in afterwards, perhaps even special tub-side cocktails? Don't be afraid to fully enjoy your hot tub through all the fun stuff available to complement it. Happy Soaking!